and how did he get the nickname “Dances with sheep”? I joined the BMW MOA in the early 1970’s, not long after it was founded, and attended my first ‘MOA rally in 1977 in Colorado Springs. As for age, I’ll say I fit the current BMW MOA demographic pretty well. I still have, and ride, the 1972 R75/5 I bought new. I’ve also had a number of other BMW bikes since then, and currently in addition to the /5 own a silver and black 1990 K75 standard, a 1990 blue & yellow K1, a blue 1992 K75S, and a black 2003 K1200RS. But, that may change, since I’m pretty sure that somewhere I hear a GS calling my name. I live in Boise, Idaho and have access to some wonderful motorcycle roads. To the north, northeast, and southeast are the mountains of Idaho, and of course, the fabulous Rocky Mountains. So, twisty roads and corner-carving is my bread and butter. There is also a lot of open country: the eastern plains of Oregon, and the wide open spaces of Nevada and much of Utah. I try to attend every BMW MOA International Rally and all the regional events. “Regional” meaning everything within a 1,500 mile radius. My annual mileage runs between 12,000 and 15,000 miles. I never forget, though, that riding is about the smiles more than the miles. My day job is as the Information Technology Manager for a national PEO (Professional Employers Organization) where I’ve been for over 17 years. I also have a degree in Management Information Systems. My four person department is responsible for support of virtually anything that plugs into the wall. I have various technical proficiencies, but my most valuable skill is the ability to work with people to identify needs and devise solutions. People love to hate technology (well other than us geek-types) mostly because it seldom works FOR them as well as it could. My job is to determine their real needs and turn them into high-function solutions that are a “cure” better then the “disease”. Prior to being a technical manager, I designed and sold business information systems. This work required the development of good interpersonal skills, persistence, patience, and the ability to see the problem from the other person’s perspective. 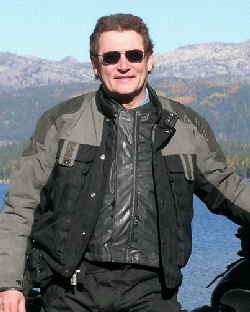 I was a founding member of the Bavarian Mountain West Motorcycle Club (MOA #50) and have served as the club’s newsletter editor and am the current President. I also belong to the Airheads Beemer Club, the Yankee Beemers, and have served as Administrator of the BMW MOA forums. In 2006 I was the Co-Chair for the BMW RA “Discover Yourself In Idaho” Rally, held in Boise. Currently I serve on the Idaho Governor’s Motorcycle Safety Council. This is a group formed by our Governor to bring together members of the Idaho motorcycle community and representatives of our State Department of Transportation. The goal is to educate the people who design highways about the needs of motorcyclists and ways to make our roads safer for everyone. Oh, the “Dances with sheep” thing... A lot of you may have seen that in my sig line from posts on different motorcycle lists and forums. Well, I’m also a forum moderator for a little group called the Slash 5 Black Sheep. Loosely tied around the idea of being all /5 owners it’s really a 24/7 Internet campfire session. One of our favorite past times is telling sheep jokes, and in 1998 I took an inflatable sheep to the Missoula rally to give to another one of our group as a gag gift. Later that night in the beer garden, the band played a particularly fetching tune and I got up with Peekaboo (the sheep) and “danced”. That was a big crowd pleaser and others wanted their own turn to dance with her. Peekaboo was the Belle of the Ball. She’s attended every ‘MOA rally since, but was unfortunately kidnapped in Spokane last summer by some black-hearted louts. The search is on and a reward offered for her safe return. Rumor has it her twin sister has been contacted and has agreed to stand in for Peekaboo, if necessary, this summer in Lima. Click here to e-mail me any comments, ideas, or suggestions for professional treatment.